We've put together these resources to help you with your interest in young birders. If you have a suggestion or request, please let us know. Learn more about Iowa Young Birders here. Bird Education Resource Directory - Includes tons of links to information about camps, activities, educational materials, and more. BirdSleuth - Helps students learn about how to study birds and contribute to the Cornell Lab citizen-science projects. Children & Nature Network - Offers lots of information about the why and how of encouraging children to get outside and enjoy nature. Every Kid in a Park - Starting in the Fall of 2015, every 4th-grader in America will get a one-year pass for free admission to all of our public lands for them and their families. Fledging Birders Institute - Packed full of resources for mentors, educators, and parents. Race 4 Birds - Provides a blueprint for groups of individuals or organizations to create a bird race of 24 hours (or fewer) for young people. Young Birders Network - Offers many resources for young birders and for parents and mentors. Searchable Ornithological Research Archive (SORA) - Free access to articles from North American ornithological journals. Bird-watching tips by HomeAdvisor - Great tips on everything from choosing the perfect binoculars to finding birds. Alan's Factory Outlet - A great info graphic on the sounds made by each of the state birds in the United States. Bird-watching in the playground - great tips and collection of resources for birding during outdoor play. 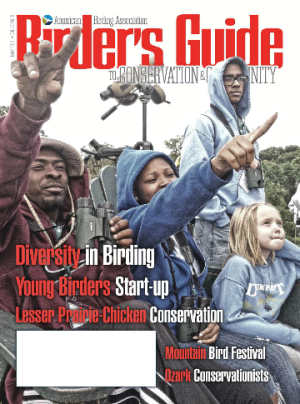 Welcome readers of the May 2015 edition of the American Birding Association Birder's Guide to Conservation and Community. You're here because you are interested in the resources mentioned in Iowa Young Birders: Story of a Start-Up. The information is right below under Free Downloads. Just complete the form and you'll get an immediate email with the download links. We hope you'll also take a moment to answer a few optional questions. THANKS! To request the download links for these documents, please complete this form. Iowa Young Birders offers scholarships to young Iowans age 13-18 who are attending one of the American Birding Association Summer Camps. Read more here. Want to connect with a young birder organization in your area? Try a Google Search and add your own state or region to narrow the results. The Myrle Burk Scholarship was established by funds received from the estate of Myrle Burk, a longtime member of the Iowa Academy of Science who had a strong interest in ornithology. The scholarship is awarded to college or university sophomores, juniors, seniors, and graduate students who have demonstrated an interest in ornithology. The Iowa Academy of Science may present up to 4 awards per year with a maximum of $750 per award. A committee of Iowa Academy of Science members reviews the scholarship applications. The deadline for application is the last Friday in March. For more information, visit the Iowa Academy of Science. Former Iowa birder, Tim Schantz, died suddenly from coronary artery disease in 2001 at the age of 36 while guiding a birding trip to St. Lawrence Island, Alaska. Tim had a consuming passion for birds and spent his life studying them and sharing his love and knowledge with others. The Tim Schantz Memorial Foundation was established after Tim’s death to honor his passion by promoting interest in birds and birdlife. With these goals in mind, the foundation annually awards a scholarship trip to the Kachemak Bay Shorebird festival held each May in Homer, Alaska. For more information, visit the Tim Schantz Memorial Foundation.